Microsoft’s teams have been working over the last few years to bring Python developer tools to the Azure cloud and our most popular developer tools: Visual Studio Code and Visual Studio. Python is one of the fastest growing languages, with both beginner and expert developers taking to it. What makes it attractive is its easy-to-learn semantics with powerful capabilities for a wide variety of applications from writing scripts, to building web services, to building machine learning models. In this post we’ll take a tour of Python Developer tools in Visual Studio, Visual Studio Code, Azure, and more. For more information and the latest news on everything Python at Microsoft, check out our Python at Microsoft blog. 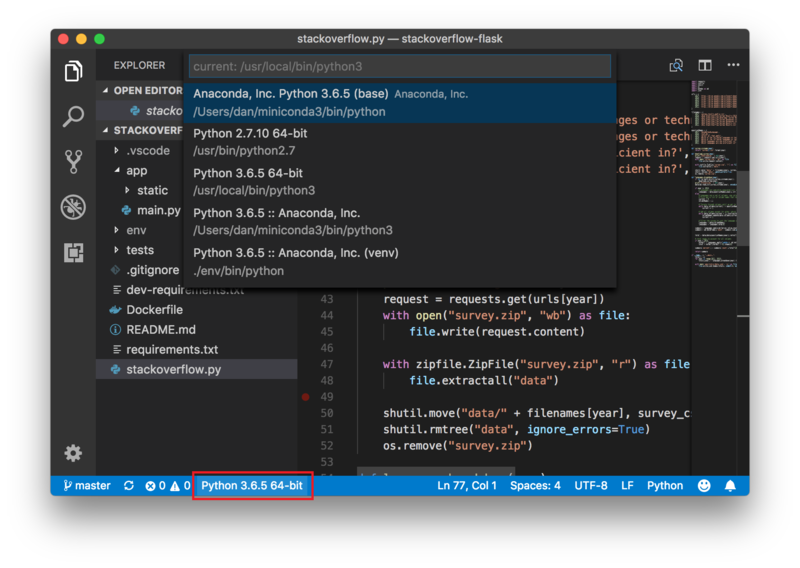 The Python Extension for Visual Studio Code is fully open source and integrates other open source Python packages for developers to provide rich editing, debugging, and testing capabilities. Python is the fastest growing language in Visual Studio Code, and the Microsoft Python Extension for Visual Studio Code is one of the most popular extensions on the Visual Studio Code marketplace! To get started, first download Visual Studio Code and then from there you can follow our Getting Started with Python tutorial to install the extension and get the basic features working. Let’s take a quick look at some of the feature highlights. The selector supports many different interpreters and Python environments: Python 2, 3, virtualenv, Anaconda, Pipenv and pyenv environments. Once you have picked your interpreter, the extension will use it for IntelliSense, refactoring, linting, running code, and debugging. You will then see preset configurations for debugging the current file, attaching to a remote debug server, or debugging Flask, Django, Pyramid, PySpark or Scrapy apps. You can then select your debug configuration and press the green Play button (or F5 on your keyboard, FN + F5 on a Mac) to start debugging. That’s not all as there’s also support for unit testing with unittest, pytest and nose; refactoring; and you can use Visual Studio Live Share to remotely collaborate on Python code with other developers! Visual Studio provides most of the functionality of Visual Studio Code, with additional powerful IDE capabilities that allow you to do more without having to drop to the command line. Visual Studio also provides unparalleled capabilities when mixing Python projects with C# or C++ projects. You can choose to install various versions of Python and Anaconda by selecting optional components (on the right-hand side in the screenshot above). To start from a blank application, you can start with the Python Application template and start writing Python code. You can also create a project from existing Python code, or you can use web templates for Flask, Django, and Bottle. Be sure to check out our Flask Tutorial and Django Tutorial for an in-depth tour of developing web apps using these frameworks with Visual Studio. 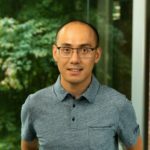 If you have the data science workload installed, there are also templates for machine learning projects with Tensorflow and CNTK. The real power of Visual Studio shines when you mix Python with other languages. You can have a solution with both Python and C++ projects, or even embed .py files in your C++ or C# projects! For a detailed walkthrough of embedding Python in a C++ application, be sure to check out Embedding Python in a C++ Project on the Python blog to learn more. Finally, also worth mentioning that Visual Studio includes a Python profiler and supports Python unit tests in the Test Explorer. You can use Python to create, manage and interact with services in Azure using the Python Azure SDK. In fact, the Azure CLI itself is written in Python, which means almost all things you can do with the CLI you can do programmatically using the Python SDK. Once you have the SDK installed there are many great services you can use, from using Machine Learning APIs with Azure Cognitive Services to hosting globally distributed data with Azure Cosmos DB. If you’re building web applications, you can deploy them to Azure Web App for Containers: be sure to check out From Zero to Azure with Python and Visual Studio Code for an end-to-end video tutorial deploying a Flask application using Visual Studio Code, or the quick-start tutorial on deploying a Flask application using the command line. You can sign-in to clone and run notebooks, so head on over to notebooks.azure.com and sign-in to try it out! Visual Studio Team Services is now able to build cross-platform Python builds using the hosted build agents and the Use Python Version tool tasks. Microsoft has also donated build time to enable CI Builds of the CPython project running on VSTS. Something else you may not be aware of: SQL Server Machine Learning Services allows you to run Python code within a SQL Server to deliver advanced analytics at scale and avoid having to pull data across the network. Finally, be sure to check out Microsoft on PyPI for all our Python packages we produce, and check out our Python at Microsoft blog for the latest news on everything Python at Microsoft.